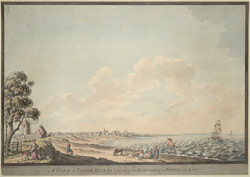 Distant view of the city of Trois-Rivieres which was known to English settlers in the 18th century as ‘Three Rivers’. The city is situated between Montreal and Quebec on the St Lawrence River at the mouth of the St Maurice River. The St Maurice River flows from the north and is divided at this point by two islands making two channels, this is why the city has its name. Trois-Riviers was founded in the 17th century and with easy transport via the river it became a centre for the trade of lumber and iron ware. In 1776 the Battle of Trois-Rivieres was waged here during the American War for Independence.